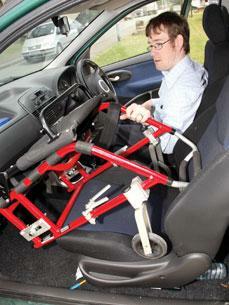 Getting a wheelchair into a car can be easy for most individuals. If you have enough upper body strength and an average sized vehicle, you can fold the frame and pop it right into the front of the passenger seat or in front of the backseat. If you have the ability to do that, you may be able to get your wheelchair into a car without using any tools. If you have a caretaker, it may be easier for them to follow these directions in order to help you get your chair into a vehicle. Some individuals do not have the ability to just “pop” the wheelchair into the car without encountering problems. There are many things that you can do in order to prevent the hassle of pushing and pulling your wheelchair and hoping that it fits inside the vehicle. In order to be able to fold and store your chair in your car, you may need the assistance of additional mobility equipment. You may need a ramp to help you transfer your wheelchair to the inside of the car. A wheelchair ramp can help take some of the weight off the wheelchair frame and will allow you to roll the chair into the vehicle. To find out what type of mobility equipment would aid you in transferring your wheelchair into your car, you should visit a local mobility equipment store and they should be able to help you find the right type of equipment for getting a chair into a car. Another piece of mobility equipment that is used to transfer a wheelchair into a car is a wheelchair vehicle lift. This type of equipment is usually installed on the side of the car if it is a van or large vehicle. Sometimes vehicle lifts are installed on the rear end of the car, where there is usually a trunk door or a rear van door. A similar device to a lift is a hoist, which actually embeds into the car once it is lifted. This means that not only does it lift the chair off the ground and onto the floor of the vehicle, but it also places the chair inside the car without having to remove the chair from the device and inserting it into a vehicle. The most obvious mobility equipment to use for fitting a wheelchair into a vehicle, is a wheelchair accessible van. Wheelchair vans have features that are unique to that type of vehicle. They have standard features such as a wheelchair lift or ramp permanently installed onto the vehicle. They also have the suited measurements to be able to fit a manual or power wheelchair without the hassle of trying to make it fit forcefully.